Teresa Aquila Just Won’t Quit… Ever! 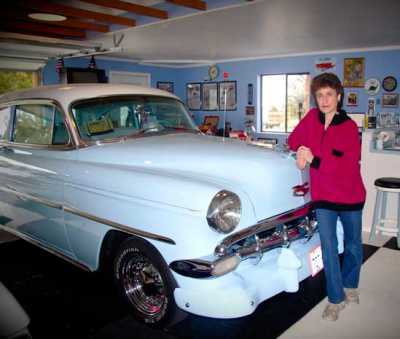 Teresa Aquila owns a fleet of 13 classic vehicles, all of which she completely restored herself. To say that Teresa Aquila takes life by the reins is the understatement of the century, because ever since she can remember, she’s been doing it all without slowing down. At age 63, Aquila doesn’t have a pause button—only forward, and that’s the way she prefers it. She has been injured on the job as a mechanic, shot as a reserve cop and marginalized by men in the automotive industry at every turn, but she keeps coming back with more fervor and determination than ever before. As a renowned mechanic, columnist, teacher and the producer of a popular auto repair radio show for women, not to mention a policewoman, Aquila isn’t afraid to take chances and follow her dreams. Her mechanical career has spanned more than four decades, working on everything from Porsches to heavy equipment, including her personal fleet of classic vehicles—all of which she restored herself. Aquila’s weekly radio show, “Teresa’s Garage Radio Show,” is broadcast on 1180 AM KCKQ every Tuesday at 2 p.m. PST. Her show’s tagline is “Empowering Women One Wheel at a Time,” dedicated to women who dare to be different and desire to become more knowledgeable of car care. Aquila’s show deals primarily with mechanical repair, but occasionally includes various topics that are related to the collision repair industry. Aquila’s career in mechanical repair started right after high school graduation, she explained. Now celebrating her 41st year as a Washoe County reserve sheriff, Aquila serves and protects the community without collecting a paycheck. It’s an arrangement she is happy with, because it allows her to dictate her schedule and participate in a lot of programs that are dear to her heart. One particular day definitely tested Aquila’s passion for law enforcement—The day she almost lost her life. Still in pursuit, Aquila became faint and had to pull over after traveling about eight miles. The chase eventually ended when the perpetrator committed suicide, and later it was discovered that he was wanted on murder and drug charges. “I was lucky, because when he shot at me, the bullet went through both of our car doors before going through my leg. Six months later, I was back on the job. People thought I was going to quit, but I’m in it for the long run,” she said. When she isn’t chasing bad guys or producing her radio show, Aquila is writing a book about her life and maintaining her fleet of 13 classic vehicles. “I love all of my cars, but I do have a special place in my heart for my 1954 Chevy Bel-Air, because I did all of the bodywork on that one myself. Every one of my vehicles is drivable and I still have [my] very first car—a 1963 Chevy Impala that I bought when I was 18,” she said. Even though her career as a mechanic hit its share of speed bumps along the way, Aquila still believes that women belong in the automotive repair industry.